LitLovers, the ‘’wellread online community’’ site had some useful ideas of what to do and perhaps more important, what not to do when choosing a book. I’ve amended based on personal experience. 1. Don’t read favourites: Reading a book someone “just loves” can lead to hurt feelings—like inviting people into your living room to critique your decor. Best to stay on neutral territory. I can’t say I agree with this one. As long as each member respects the others’ right to think differently it’s going to be a pretty dull if the only choice of comment is beige. Mind you, if actual blows are traded then it’s probably time to review the selection process. 2. Choose books that will promote good discussions: Stating the obvious really but some books, whilst they are a great read, won’t offer a lot to in the way of discussion. Look for works rich in characterization and ideas. A very good idea. The big question is how to ensure that the ingredients are there if you haven’t actually read the book? And even then, opinions differ. Whilst a detailed trawl of reviews can be helpful sometimes going on a gut feeling seems to work just as well. 3. Don’t choose for the whole year: It ties you into a year-long rigid schedule with no flexibility to add exciting new works. 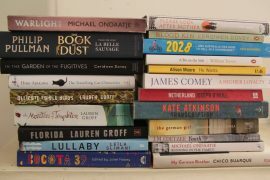 On the other hand, based on my own experience of the wonderful Book Club I was a member of in Fiji, the year-long list worked well. There were clear rules (x number of Pacific-based writers, x number of fiction books etc.) and everyone had their say on the selection, with votes if there was a tie. It also allowed people who had a limited access to books but travelled a lot to stock up while away. 4. Choose two or three books at a time: This allows members to read at their own pace. It’s especially helpful for those who travel or miss a meeting or two. I’m in two minds about this. Whilst it does mean the faster readers can gallop ahead, it also puts subtle pressure on those who perhaps don’t have as much time. It did work well when we all wanted to read a very long book but some were worried about finishing it in time for the next club. We chose a shortish book for the next club and everyone got two months to read the whopper. So perhaps this could be saved for special occasions. 5. Don’t get stuck in a rut: Mix styles and genres. Intersperse heavier reads and lighter ones; fiction (current and classic) with nonfiction, poetry, and drama. This has been the subject of much discussion among our group. On Monday we finally broke away from our ”fiction only’’ rule, resolving to be far more exlectic. Several people got very passionate about having the odd classic or two. We didn’t quite make the leap to including poetry and drama, but who knows what the future holds? 6. Establish limits: Set some basic ground rules up front, so you don’t get into misunderstandings as you go along. For example, some clubs limit page numbers. Or only allow paperbacks to keep costs down. I’m not sure you need a strict rule for this. You’d think simple courtesy would cover it. 7. Don’t let the same people choose: Make sure everyone gets a say in what books to select. One person shouldn’t be in charge of the process, nor should one or two dominate. Whilst I agree in principle, no-one should feel pressured into coming up with an idea when it is ‘’their turn’’. We’re going with the rule of everyone gets a turn to choose unless they voluntarily decide to abstain. It will be interesting to see how we fare under the new system. In particular, we ruled that there should be no rules after a number of members complained that their life at work was was ruled by rules. So, Rule 8, there are no Rules 1-7.